Laura got me a Jet combination Jointer / Planer for a Christmas present and, after a couple of other projects without using it, I decided I needed to make something explicitly to use the jointer. 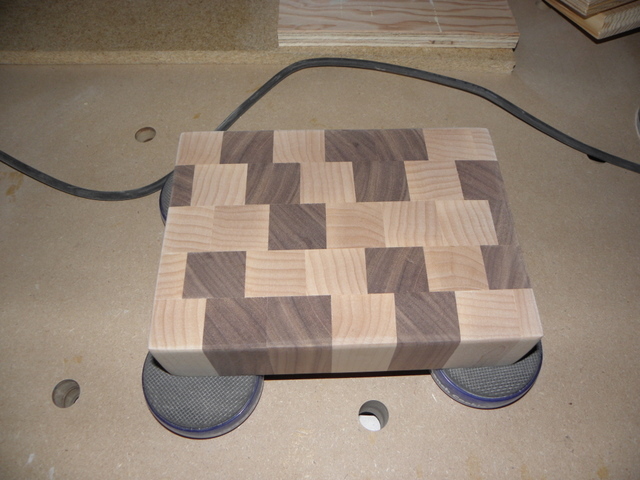 Here is a “practice” cheese board that I made from maple and walnut. This is unfinished and I plan on finishing it with mineral oil, so I’ll post another pic once the finish is complete. It is “practice” in the sense that I wanted to try out the jointer and started with a fairly small board (this is roughly 8″ x 6″) to get a feel for making butcher block boards. I think it turned out pretty well as a first try.